I had the pleasure of meeting professional concept Don Carson through my digital drawing class recently. He sat down and showed us a demo of his work, revealed his workflow and planning process, then was kind enough to answer a ton of questions the class had. 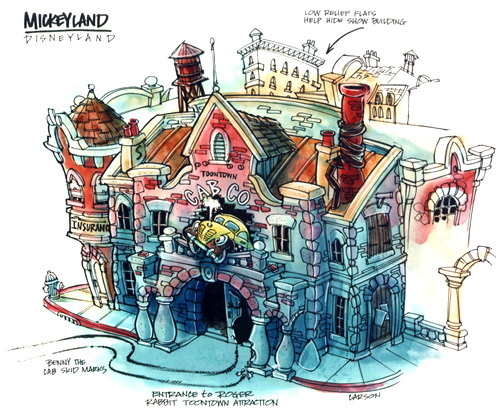 Don works on concepts for many things, but I think his most impressive accomplishments are creating concepts for Disney theme parks and rides. The first thing I noticed about Don was his warm welcoming personality. He addressed every one in the room with kindness and respect. he was very honest, and humble when he spoke about his work, abilities and passion. I think everyone in the room felt like he was our cool old uncle. As I stood behind two rows of people clustered tightly around Don, it was clear he had the room’s attention. Don flipped through his sketchbook, and scrolled through previous projects while I, and the surrounding students watched in awe. Don’s passion for what he does was unmistakable. I think the only time I looked away from his work was to confirm that everyone else shared the giddy expression I had on my face. of a lot of his ideas. he had page after page of beautiful sketches. A single page of his sketchbook would have anywhere from twenty to fifty small objects drawn on it. Each page seemed to have a different theme. One notable page was filled with architectural details from Paris, he had made while traveling. He showed us other pages that he had sketched while watching movies for reference. While explaining the multiple processes he goes through to complete a project, it was clear Don goes above and beyond when working or a client. He explained that our job as an artist and professional is to bring the client a project that when looked at leaves them with no questions. I thought that was a pretty important statement.Don mentioned that he hadn’t needed to show his portfolio to anyone in twenty years, proving that word of mouth advertising still works if you make your clients happy. I found everything about Don’s presentation to be extremely motivational. From the basic planning and design, to finished project and client relation, Don Carson is a true professional. I think everyone in the class came away with the same impression. Its amazing to have the opportunity to be around so many artists at school, but to be able to share ideas with someone with that sort of experience was a real treat. I was lucky to be able to share some of my work with Don, and ask him a few questions. He gave me some good advice and things to think about while working. He was very kind when addressing my work. I was very proud and a little blown away when he said that he felt I could get work at any video game or movie studio, after looking at my concept art. I personally know I have a long way to go before i reach the level I want to be, but getting a pat on the back from someone like Don reminded me I’m headed in the right direction. This entry was posted in X4 Professional Practices on March 3, 2015 by alanthompson3.